CRANFORD POP. COULD RISE 8 PERCENT WITH PROPOSED APTS. CRANFORD — Hartz Mountain Industries proposes to increase the township’s population by 8 percent, according to its application to build 905 apartments at 750 Walnut Avenue. Hartz Mountain is proposing a two-phase build out of the property, with five apartment buildings in total, with phase 1 being built by 2019 and phase 2 by 2021. The triangular shaped property abuts the Hyatt Hills Golf Complex to the west, the NJ Transit rail to the north, and comes to a point at Raritan Road to the south, and fronts Walnut Avenue on the east. Two of the five apartment buildings would be four stories, measuring 54 feet, eight inches high, while three of the buildings would be five stories, consisting of four floors of apartments over a surface-level garage, measuring 66 feet, eight inches high. In addition to the apartment buildings, the site would include two pools, two clubhouses, parking, new driveways and a new traffic light at Walnut and Behnert Place. The plan estimates the 905 units would add 1,846 people to the population, increasing the population by 8 percent. As per the 2010 United States Census, the township’s population was 22,625, according to Wikipedia. Since the 2010 U.S. Census, some additional 600 units have either come on board or are proposed: Riverfront at Cranford Station, Woodmont Station, the proposed Birchwood Avenue development, and a development on Walnut Avenue off of South Avenue and another on Centennial Avenue approved this year. The proposed plan would allocate 15 percent of the 905 units for affordable housing. Market-rate units would be a mix of one- and two-bedroom apartments, and affordable-housing units would be a mix of one-, two- and three-bedroom apartments. Of the market-rate units, 380 would be one-bedroom and 386 would be two-bedroom. Of the affordable-housing units, 28 would be one-bedroom, 82 would be two-bedroom, and 29 would be three-bedroom. The two clubhouses would measure 8,200 and 5,500 square feet. Parking would include 1,723 spaces within two garages as well as surface parking. Hartz Mountain also is seeking to make the 30.5-acre parcel an area in need of redevelopment, which could allow for tax breaks to the developer. Hartz Mountain cites that it meets two criteria for such a designation. Since Bank of America has vacated the premises, and LabCorps intends to close its lab facilities there, Hartz suggests that retrofitting a lab for another use would be costly for a new tenant, and the office building once occupied by Bank of America is out of date, has an odd, outdated layout, and is not located centrally to walkable mixed use locations and transit preferred today for office space. Originally, Hartz Mountain had attempted to rezone Hyatt Hills, but Clark Mayor Sal Bonaccorso said Clark would only use that property for recreation use, as it is currently zoned, Mayor Bonaccorso stated in his affordable-housing presentation on March 29. 750 Walnut Avenue is currently owned by H-Cranford Conduit LTD Partnership, which purchased it in 1996, and pays over $1 million in property taxes on the site. State Population Increase records show that H-Cranford Conduit’s Principal is H-Cranford II, Inc. H-Cranford II’s state filings show that Vincent Rubino, Frank Roscitt and Phillip Patton are the listed Principals. Another registered corporation, H-Cranford Limited Partnership, shows Hartz Mountain Industries, Inc. and H-Cranford, Inc. as its Principals. Hartz Mountain Industries is registered with the State of New Jersey as a Foreign Profit Corporation and lists President Gus Milano along with Vice Presidents Frank Roscitt and Curtis Schwartz as Principals. All five related companies registered with the state are deliverable to Phillip Patton, Esq. at the same address in Seacaucus. Hartz Mountain Industries is also listed with the associated name Meadowlands Mall at Seacaucus. CRANFORD—As so many did a year ago, Joe LoGiudice watched as the rain fell and the water rose, turning his property and others near it into one continuous lake. LoGiudice is among the lucky members of his community; the water rose to within a stone’s throw of his Wadsworth Terrace house, then it receded. But the 51-year-old doesn’t feel any sense of relief, nor do his neighbors who survived the storm with little to no damage to their homes. They’re worried the worst is yet to come and think a high-density housing development—one planned for a lot a block away from LoGiudice’s home—will be the reason. The project, a 360-unit complex that would be constructed on a 16-acre site in Cranford’s north side, is derided by local officials and residents alike. They all worry it will make the flooding worse, upsetting a delicate balance between wetlands and dry land. The developer and its experts say the building won’t cause any new flooding and will actually improve drainage in some areas. But those assertions have been little comfort to residents and township officials. The fight to stop the development on Birchwood Avenue—now closer than ever to becoming a reality—has been going on for years, but it was Irene that electrified opponents. Their fears embody just how bad the flooding was after the storm. 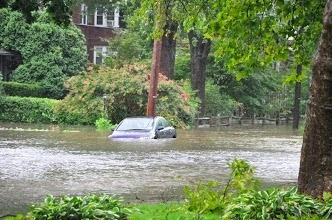 There was flooding in Rahway, Elizabeth, Springfield, Union, Mountainside and other towns. Communities were bisected by floodwaters. There was tens of millions of dollars in damage. One early estimate put together by the county’s Office of Emergency Management figured the damage surpassed $100 million. The federal government has pledged or paid more than $50 million in grants and loans to residents, business owners and governments in Union County. Cranford was, without a doubt, left in the worst shape. 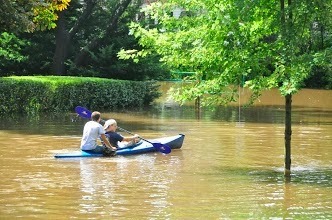 Residents canoed through the township’s downtown, flooding stretching for blocks. The municipal complex and police department were underwater. Nearly 1,300 residences—or more than 15 percent of the township’s houses—had significant damage, officials said as the waters began to recede. Some 200 houses had flooding up to the first floor. Brookside Place School, which had 2 feet of water inside it, was closed for months—displacing students and teachers. The damage there cost more than $1 million to repair, much of it reimbursed by the federal government. The first floor of the municipal building is still closed, the damage totaling some $3 million, officials say. But as bad as it was, they all say the Birchwood development would make it worse. The site, about 16 acres in size, is in a quiet neighborhood thick with trees. There’s vacant office space on the property, which is next to an assisted-living facility. Across the street is the township’s recycling center. And behind the property are woods—very wet woods, some considered wetlands—that stretch back to houses on Wadsworth Terrace, where LoGiudice lives. After Irene, much of the property was underwater. So was Birchwood Avenue. That’s why local officials object to the housing project. But there are several acres of dry land there, and that’s where the developer would like to put the four-story residential buildings. The company, Cranford Development Associates, is a subsidiary of the Paramus-based S. Hekemian Group. The company successfully sued the township through a “builder’s remedy” case, arguing Cranford has a legal obligation to allow the high-density housing so long as at least 15 percent of the units are sold at affordable rates. Superior Court Judge Lisa Chrystal ordered the township to change its master plan and zoning ordinance to allow for the development, and she took away the authority of the local planning board—handing it over to a special hearing officer who reports to her. Site plan hearings have been going on for weeks, held in Superior Court in Elizabeth. No one from the developer’s office could be reached to discuss the project. Peter S. Hekemian, the parent company’s vice president for development, did not return two messages left at his office. The company’s general counsel has been away on vacation. But the group’s plans are made clear in court filings and through testimony during the ongoing site plan hearings in Elizabeth. Despite the concerns of locals, they say they will be able to mitigate any issues with flooding and will meet state environmental requirements. They have not yet received all the required state permits, and the height of Birchwood Avenue will need to be raised to do so, but they believe they will eventually be given the final go-ahead. “Flow from the development will first go into the underground system. It will be held for a period of time, and it will be released at a rate which then complies with” state standards, Dipple testified this month at the site-plan hearing. That system and other steps the developer plans to take to avoid flooding issues miss a broader point, says Richard Marsden, the township engineer. The site where the housing would be built is part of a much larger flooding plain—one that stretches across Cranford and into Kenilworth, he said. It’s shaped like an hourglass, and filling in the ground on Birchwood could create flooding elsewhere, in areas that stay dry now, Marsden said. “My argument is, by filling it in here, you’re going to restrict it—it’s going to back up,” he said. It’s that prospect—and the memories of Irene, along with other storms of years past—that have so many people in the community up in arms over the development. Some formed a group, Concerned Citizens of Cranford, and have hired an attorney to raise objections through the state Department of Environmental Protection. So many people were interested in attending the site planning hearings that the township had a bus to drive residents to Elizabeth. Even Gov. Chirs Christie, who lived in Cranford two decades ago, has weighed in. That’s Liz Sweeney’s nightmare. She lives on Wadsworth Terrace, on the opposite side from LoGiudice. Sweeney, a member of the Concerned Citizens group, never had to worry about the flooding. She will worry if the development is built, though. CRANFORD — If the township is going to make a move towards changing its current form of government, residents will have to make their voices heard on the issue or forever hold their peace. Last week Mayor Tom Hannen said the township will be repealing a 2012 ordinance approved late last year that would have paved the way for a charter commission to investigate changing the current form of government. Although the ordinance is scheduled to be repealed at the June 11 township committee meeting, Hannen said the issue is far from dead. “In order to move forward we have to repeal the old ordinance that allowed us to establish a charter commission,” the mayor explained, adding that by doing this he hoped residents would come forward to say how they feel about the issue one way or another. Right now even he is on the fence. “I’m not sure what to do. This is about Cranford’s future and how residents will be governed, not just about the present,” Hannen said, suggesting whatever the township decides should be based on input from residents. “I hope repealing the old ordinance brings out residents so we can hear how they feel about this,” he said, pointing out that the governing body needs to know how people really feel about the current form of government and if a change is something they want. But that is not the only problem facing Hannen. Two minority Republican members on the committee are strongly in favor of a charter study and the mayor said he cannot ignore their concerns. “It was late in the year when it was brought up, right around the holidays when most people are busy. Now we have had the ability to think about it clearly and the timing is better,” the mayor said. At the time, former mayor David Robinson, Lisa Adubato and Andy Kalnins supported the measure while Democrats Kevin Campbell and Edward O’Malley did not. At a recent meeting Campbell was still against changing the township committee form of government, telling fellow committee members he did not see it as a “cure-all” for the problems facing the township. “I haven’t heard anyone express any real support for a charter study or for changing our form of government,” he said, adding that only two people actually commented on the issue in the past. O’Malley saw things from a different perspective. “I don’t see this as a public support issue. I see it as effective government and effective access,” he said, mentioning it was not “effective” to keep bringing up the subject every five or six years. Hannen is keeping an open mind but did feel bringing aboard an experienced, full-time administrator changed the picture considerably from last year when the township was in a state of flux. “Having Joe Hartnett has been a blessing. He is on top of everything and has everything under control, which is a big change from last year,” the mayor said mentioning that he believed a lack of long-range planning caused the problems the township experienced in the past. The question of changing the form of government in Cranford is not a new one. Periodically the issue has surfaced and then gone off the radar again. In fact, in 2007 when the matter was brought before voters in a referendum, 75 percent were in favor of a change. Records indicated there was unusual turnout when the issue came up on the ballot, considering it was not a federal or gubernatorial election, with 3,611 residents in favor of changing the form of government and 1,984 against. This all changed the following summer after a nine-member Charter Study Advisory Committee spent months investigating whether a change in government was in order. In August 2008 this committee recommended keeping the current township committee form of government, suggesting the administrator’s role be extended to increase efficiency. Although the community came out in force to support a change in government, when it came time for the advisory committee to hold a public hearing on the issue, only a handful of residents attended and the township only received six emails on the topic. Currently the township operates a committee form of government with five members elected at large for three-year terms. Although there is a mayor, the position is not elected at large, but rather decided by the majority members on the committee, as is the deputy mayor position. There are four forms of government municipalities can choose from under The Faulkner Act, a 1923 state law that permitted towns to choose between four types of government. The township form, like Cranford, is the oldest form of municipal government in New Jersey. Following that is the town form with the mayor and councilman selected in partisan, not political, elections. There also is a city form of government with an elected mayor and council, like Rahway and Linden, and the borough form, which is the most popular form of local government in the state where the mayor is elected to a four-year term. Springfield is a year into the process of investigating whether to switch to one of the three other forms of government, with a referendum expected to be on the ballot in the November election. A charter committee appointed in January consisting of five members is currently looking into all options and is expected to render a decision by August. Like Cranford, this is not the first time the issue surfaced. In Springfield in 1958, a charter committee looked at other forms of municipal government and made recommendations but nothing came of it. In 1996, the issue again came up and a Springfield Government Study Committee looked into how the township government was organized and the processes it used but again, nothing came of this venture. This past November voters approved a referendum by a 170-vote margin, with the vote tally coming in 2,391 to 2,221 in favor of looking further into a change. Even though political power on the committee switched from Republican to Democrat, the measure did not die in the process. A charter committee was formed to look into the matter and is expected to return with a report by August. According to a report by the charter group, it will look into several issues, including studying the present form of government by interviewing both present and past governing body members, civic leaders and media representatives. The group also will hold public meetings to inform voters of other forms of government prior to preparing a report with a final decision on the matter. The charter group said after digesting this information they will decide whether to retain the current form of government, retain it with modifications, suggest changing to one of the three other forms of town government, or petition the legislature for a special charter, which could include amendments to the present town charter. CRANFORD – An independent report commissioned by the Cranford Township Committee has found that there was no conflict of interest in Phil Morin’s representation of Cranford on the Lehigh Acquisition site plan hearings relating to 555 South Avenue or the Birchwood Avenue/ Cranford Development Associates affordable housing litigation. The report by Michael Ambrosio, an attorney and professor at Seton Hall Law School, made this opinion on the basis that the law firm of Florio Perucci Steinhardt and Fader (FPSF), which employs Mr. Morin, withdrew its representation after the deed for 555 South Avenue was transferred from Lehigh to Woodmont Proper ties in March, thus removing a potential conflict of interest, as the firm would have been representing both the developer, Woodmont, and the township. Mr. Ambrosio also determined Mr. Morin could continue to represent Cranford on the Birchwood/Cranford Development Associates litigation and other unrelated matters. Individual homeowners and members of the Concerned Citizens of Cranford have been opposed to the proposed development of 360 apartment units, with 60 affordable units, by a subsidiary of the S. Hekemian Group called the Cranford Development Associates (CDA). “His credentials speak for themselves. He’s acknowledged that our firm acted correctly. It’s exactly what I would expect. We don’t represent clients in every aspect of their work (Woodmont),” Mr. Morin said. In a press release issued to this newspaper, Mr. Morin said, “While I was confident that Professor Ambrosio would not find a conflict, it feels great to be vindicated by one of the most well respected ethics professors in the State of New Jersey as to our firm’s representation of Cranford,” Mr. Morin said. When asked to comment at the June 5 planning board meeting, Mayor Thomas Hannen, Jr. said he had no statement to make regarding the report. Following his presentation in executive session to the Cranford Township Committee last week, Mr. Ambrosio said it took so long to do the research and review the findings of the Concerned Citizens and information from (FPSF) that the report had been delayed. In response, Mr. Morin said in a statement to The Leader, “The same citizens who argued unsuccessfully that our firm had a conflict at the Lehigh site plan hearings have concocted an new theory that is equally meritless. The fact is that the Lehigh/555 South Avenue litigation was severed from the case and was finally dismissed with prejudice as a result of the 2010 settlement by the court’s order on March 22, 2013,” Mr. Morin said. “Professor Ambrosio acknowledges that we did not even find out that a Woodmont subsidiary purchased the property until April 12. Our firm presented the court-ordered amendments to the master plan to the planning board on April 3 at which several of the members of the Concerned Citizens group were present and spoke but they raised no objections at that time. Furthermore, the final hearing on April 22 was held and the conflict issues were raised again, including Woodmont’s recent acquisition of the 555 property. Cranford residents living on Nomahegan Court have taken issue with what some are calling ‘The Great Wall of Westfield,’ as a builder’s remedy lawsuit results in a housing unit being built on the border of town. CRANFORD — Yet another builder’s remedy lawsuit, previously settled by Westfield and the developer, brought Cranford’s Nomahegan Court residents to an 11th hour hearing before a Superior Court judge Monday. The proposed development of townhomes is located at 206 Springfield Avenue next to residential developments on both sides and a senior assisted living facility, which is on six acres of land. At the hearing residents learned that Superior Court Judge Frederic Kessler had no say over the project itself but only whether ordinances fairly complied with the state affordable housing plan. His decision is not expected before Tuesday. The development, a 24-unit townhouse project planned by Sunnyside Senior Housing of Westfield, became the subject of controversy three years ago when it became clear their right to build affordable housing was being impeded by the municipality The builders remedy case came about because Westfield did not have an affordable fair housing plan in place under regulations set forth by the state Council On Affordable Housing. These regulations allowed the developer to bring the builders remedy case against the town. Although Westfield and the developer eventually settled the lawsuit this year by changing ordinances that would allow the development, Cranford residents living on Nomahegan Court, which borders the property to be developed, were not happy with the end result. At issue was the fact that the 24-units only included four affordable housing units and none involved senior housing. On May 7, Westfield held a public hearing prior to changing the zoning allowing affordable housing, but residents abutting the parcel of land were not satisfied. Concerns brought up by the Cranford residents included water run-off, traffic and changing the look of the neighborhood. At this meeting, Westfield councilman James Foerst tried to assure the concerned residents that the town did have their best interests in mind. “We wanted to be good neighbors,” he said, pointing out that under the settlement agreement, the developer was limted to 24 units, as opposed to the 60 they originally requested. Foerst also said at the meeting that the town was requiring the developer to have water drainage on the property and direct the project toward Westfield and not Cranford. “We were sued. We didn’t want to change the zoning,” another councilman interjected. Although allowed to express their objections, in the end town attorney Russell Finestein advised those opposing the project to either send their objections in writing to Kessler or voice their concerns at a Superior Court hearing June 10. The purpose of the Superior Court hearing was to give a final legal stamp of approval on the ordinances passed by the Westfield governing body in May. The ordinances, although approved by the governing body, do not go into effect until approved by the court. Kessler, a Cranford resident, while agreeing to hear comments by objectors Monday, told the 15 or 20 township residents his job was to rule on the fairness of the plan involving affordable housing, not local zoning or planning issues involving the project itself. Despite this, Nomahegan Court residents elaborated on the density of the project, including that the 1.5 acre strip of land was only 95 feet wide and 700 feet long. Their objections centered on the fact the proposed project included three-story townhouses and a ground-level garage. Even if Kessler approves the ordinances required for Westfield’s affordable housing plan, the developer of the project still has to go before the Westfield Planning Board for final approval of the construction plan before ground can be broken. CRANFORD — A possible conflict of interest on the part of the attorney representing the township in the Birchwood Development litigation has hung heavily in the air for months, but a report commissioned by the governing body found no such conflict. Although controversy has surrounded the complex and litigious issue of the Birchwood development project for several years, a report issued on Tuesday, June 11, by Seton Hall Law School professor Michael Ambrosio attempted to clear the air of any possible legal misconceptions brought to the township’s attention in March. The Township Committee hired Ambrosio, who also teaches legal ethics at Seton Hall, to put to rest accusations that Phil Morin, a former mayor and township attorney, had a conflict of interest when his firm represented Cranford in the Birchwood lawsuit. The lawsuit, which the township has been embroiled in for several years, involves a proposed development on Birchwood Avenue for 360 apartments, 60 of which will be affordable housing units. Residents living in the quiet neighborhood of single-family homes adjacent to the 15.8-acre property have continued to fight the project, with the township spending almost $1 million in legal bills waging that battle. In March, resident Liz Sweeney, a member of the Concerned Citizens of Cranford, told the Township Committee she discovered what appeared to be a conflict of interest on the part of Morin, a partner at the firm of Florio Perrucci Steinhardt & Fader. She claimed Morin, representing the township in the lawsuit to stop the Birchwood development project, had a potential conflict of interest because of the connection his law firm had in opposing legal matters with Cranford. She pointed out that, because Michael Perrucci was a developer with Woodmont, there was a direct conflict of interest. Woodmont, she added, was directly related to another builder’s remedy lawsuit brought against the township at 555 South Ave. by Lehigh Associates. Given these latest developments, Sweeney, along with others, including former Mayor Mark Smith, felt the township had to look into the matter because of the connection the two had in relation to the Birchwood development. In the past, Woodmont Properties filed a lawsuit against Lehigh, alleging it had a joint venture in the development of the South Avenue property. Woodmont also noted in this lawsuit that it provided “substantial assistance” in pursuing the builder’s remedy lawsuit against Cranford. At the time Morin’s firm was representing Cranford in the Birchwood lawsuit, Woodmont Properties was listed as a client on the law firm’s website and Perrucci was a minority partner with Woodmont in two real estate development projects. The projects included a 25 percent interest in a Pennsylvania project and a 12.5 percent interest in a South Amboy development. When this information surfaced, the Township Committee allocated $5,000 to hire Ambrosio to explore all the facts and provide his opinion on whether there were ethics violations involved. Ambrosio’s nine-page opinion noted from the start that conflict-of-interest issues are “fact sensitive” and can only be resolved by painstaking analysis of the facts and circumstances surrounding the representation of a client. He pointed out that, although Morin’s law firm provided 52 hours of representation while his firm was also representing Cranford, following the builder’s remedy lawsuit brought by Lehigh, his firm did not represent all of Woodmont Industries partners and never represented Woodmont’s interests in 555 South Ave. He also found Morin’s firm did not represent Woodmont when it filed action against Lehigh. It actually was represented by Greenbaum Rowe. Ambrosio said, since Morin’s firm did not represent Woodmont, there was no basis to conclude that Florio Perrucci Steinhardt & Fader “had anymore than a potential conflict of interest arising out of other unrelated matters.” However, the Seton Hall law professor did conclude the firm’s potential conflict became an actual conflict when Woodmont acquired title to the 555 South Ave. property on March 25, 2013. This conflict, he said, only related to Morin’s firm representing the township in legal matters relating to the property on South Avenue, not the Birchwood Avenue builder’s remedy lawsuit. Ambrosio also pointed out that Morin’s firm withdrew as counsel on the Lehigh matter after they became aware of the closing of title and the public was advised of this on April 22, during the public portion of a workshop session of the Township Committee. He also cleared up another legal misconception brought up by residents against the Birchwood project, who said Morin should have advised the township of his clients possible conflict. Finally, Ambrosio said any potential conflict of interest was resolved by Morin’s firm withdrawing from representation, so the firm could legally represent Cranford in its litigation in the Birchwood matter. Morin said he was pleased about the report, noting, “While I was confident professor Ambrosio would not find a conflict of interest, it feels good to be vindicated by one of the most well-respected ethics professors in the state of New Jersey.” Nevertheless, the former mayor felt the entire issue could have been avoided. “As a lifelong resident, I am proud to be a part of Cranford’s legal team fighting this project, and I have advised the Township Committee that I will assist our appellate counsel in anyway necessary,” Morin said in a statement to LocalSource on Tuesday. The township, though, while not commenting publicly on the report, did explain what would happen from this point on. “The Township Committee has moved on and has hired two other attorneys to handle Birchwood from this point on,” said Mayor Tom Hannen on Monday, June 24. The attorneys, Jeffrey Surenian and Robert Podvey, he said, came highly recommended. He did not, however, have any comment about the fact that Podvey was the attorney used by the Concerned Citizens of Cranford in their fight against Birchwood. But regarding the hiring of the two new attorneys, the mayor explained why the township decided to go this route. “We lost all motions to reconsider the Birchwood case up until this point, so this will provide a new set of eyes,” Hannen said, adding he believed there was enough reason to challenge the appellate court before the New Jersey Department of Environmental Protection. Hannen explained that Morin would continue to represent the township in certain Birchwood matters. “Phil is finishing up on issues that Judge (Lisa) Chrystal said we had to do,” the mayor said, referring to a judgment that came down in the spring, paving the way for the Birchwood project to proceed to the construction phase. WESTFIELD – Approximately three dozen residents came out to Tuesday night’s Westfield Town Council meeting to object to the rezoning of 206 Springfield Avenue, and several other parcels of land to allow for future development of affordable housing. Public hearing was held before final approval on ordinances effecting Springfield Avenue, along with Central Avenue, New Street, South Elmer Street, and North Avenue. A final vote on an ordinance that would affect zoning on South Avenue was tabled due to possible pending development and environmental issues. Sunnyside Senior Housing, LLC, owned by Ray Rodgers, will construct 24 units, four of which will be set aside as affordable housing. According to Councilman Jim Foerst, despite the name of the company, the new units will not be limited to senior citizens. In January 2009, Sunnyside filed a lawsuit against the Town of Westfield and the planning board alleging that Sunnyside’s attempts to develop the property was “rebuffed” by the defendants. The suit was considered a “builder’s remedy” lawsuit, as the town did not have an approved fairhousing plan under regulations set forth by the Council On Affordable Housing (COAH). The majority of the residents who spoke out against the rezoning and pending development on Springfield Avenue were residents of Cranford, whose homes border the property. Many of the residents cited concerns about water run-off, traffic implications and changing the look of their neighborhood. Several of the residents also said the previous owners, who sold the property in 2004, would not have sold the property to Mr. Rodgers if they had known his intent. “We were sued, we didn’t want to change the zoning,” Councilman Sam Della Fera told the residents. Cranford resident Steven Conti, who bought his house two months ago, said his back yard would be destroyed by this development. Westfield residents Ben and Laura Gomez, who live across the street from the property, said they feel the property should remain a single-family home, and that they heard the condos that will be built will be sold for between $700,000 and $800,000. Residents of South Elmer Street and a property owner on Central Avenue also inquired about the zoning changes, and potential development. According to Mr. Foerst, development would be limited to residential only. While the ordinances were approved by the council, they will not go into effect until the town has approval from the court. Following court approval, the developer will have to appear before the Westfield Planning Board for final approval of the construction plan before anything can be built. Property owners who are affected by these new ordinances need to file a written objection, a form which they can obtain from the town, and will have the chance to be heard before state Superior Court Judge Frederic Kessler on Monday, June 10, at 9 a.m. at the Union County courthouse. CRANFORD — Hartz Mountain Industries LLC has adjourned its application before the planning board to rezone 750 Walnut Avenue to Wednesday, February 21, 2018. Hartz has proposed to make the 30.5-acre parcel a residential zone where currently it is zoned for commercial use. Hartz had presented redevelopment plans to the township committee for a multi-building complex containing 905 multi-family units, including lowand moderate-income housing, pools and a community room. “When would be the right time to ask for an environmental impact study?” board member Dan Aschenbach asked. Board Attorney Mark Rothman said the board could broach that during the hearing. Mr. Rothman said Hartz has already filed its application with the municipality and it is deemed complete. Hyatt Hills Gold Complex located adjacent to 750 Walnut Avenue is a brownfields site with monitoring wells on the Hyatt site to monitor the groundwater. There also are monitoring wells at 750 Walnut Avenue, according to Mr. Aschenbach. Mr. Aschenbach believes an environmental impact study should be done prior to an application being heard, he told The Westfield Leader. “But I believe the conclusions of such a study will help in ruling this issue in or out,” he said. During public comment, Arlington Road resident Rita LaBrutto, also a former planning board member, said she had concerns about the transparency of the planning board. “The Open Public Meetings Act says your agenda should specify what you will be voting on or discussing,” Ms. LaBrutto said. The board had placed on its agenda posted in the town hall on Monday that it was to present a study on making a portion of North Avenue in the downtown a redevelopment zone, Ms. LaBrutto said, but then was later removed. She said the public had not been given the 10-day notice that the Act requires. “It is something we haven’t even seen yet,” Board Vice-President Bobbi Anderson said. “If a draft is made available as a draft to the board on December 20, it should be made available to the public,” Ms. LaBrutto told Mr. Aschenbach. “I think that is true,” Mr. Aschenbach responded. The Downtown Management Corporation (DMC) has held strategy meetings, she said, where the DMC has suggested allowing a fourth story in the downtown. Ms. LaBrutto said she is not a proponent of having a fourth story permitted in the downtown in the zoning laws because it can add to traffic congestion, impact parking availability and could add children to the schools. “I don’t see it as a permitted use on Springfield Avenue across from the municipal building. I think it has its place, such as across from the railroad,” she said. CRANFORD – State Superior Court Judge Lisa M. Chrystal has deemed Cranford Township’s Master Plan compliant with the New Jersey State Council on Affordable Housing (COAH) requirements. The township’s planning board amended the Master Plan on April 3. In a decision handed down on Monday in Superior Court in Elizabeth, the judge ruled that the township complied with a December 11, 2011 order which Judge Chrystal imposed after the township lost a builder’s remedy lawsuit brought by Cranford Development Associates (CDA). “The decision will result in an order of repose which will protect Cranford from any challenges relating to Fair Share Housing until December of 2018,” said former Township Attorney Philip Morin, who represented the township at the compliance hearing. Mr. Morin also said that Judge Chrystal asked attorney Stephen Eisdorfer of Hill Wallack LLP of Princeton, which represents the CDA, to prepare an order of final judgment in the case. Mr. Morin also said the township can now go forward to appeal Judge Chrystal’s previous decision, which ruled in favor of the CDA building350 apartments at 215/235Birchwood Avenue, 54 of which would be affordable housing units. The township is opposed to the project because of flooding and contamination concerns. Cranford has now met its first and second round of affordable housing obligations to the state. If Cranford has any third round obligations, Mr. Morin said they cannot be met by new development since the township has no space to develop, but could be met by rehabilitation of existing properties. As a result of this compliance, 24 affordable units will be allocated at the Lehigh Associates project, comprised of 167 units to be built at 555 South Avenue. CRANFORD — The site plan proposal for a controversial mixed use building that would replace the abandoned Lehigh’s Auto Repair on Centennial Avenue was approved by the Cranford Board of Adjustment Monday night. The site plan, by applicant 310 Centennial Avenue, LLC, showed a 1,952 square foot building with one or two retail spaces on the first level and 20 residential units occupying the second and third floors. After a night of complaints from owners of single-family homes surrounding the site, the board came to the conclusion that the mixed-use building is better than the other likely options—a Dunkin Donuts, a convenience store, or a vacant site. “If we denied this, it might sit like this for another 10 years,” Board of Adjustment Chairman Ronald Marotta said at the public meeting. Variances sought included density, height, exceeding the stories permitted, parking, and setbacks, amongst others. Although the residents were against the regulation, Mr. Triarsi explained that more density in a downtown area is good because the new residents will utilize the town’s businesses. “More density in a downtown neighborhood is better than less density,” Mr. Triarsi said. Marie Mayer, the owner of the neighboring 304-306 Centennial Avenue, brought up that part of the development would use up land that she owns. Mr. Triarsi denied this claim, but said he would speak to her about it if he sees a document stating that the land belongs to Ms. Mayer. The Centennial Village Group asked if a crosswalk accompanied by a flashing pedestrian signal could be placed between North Lehigh Avenue and Winans Avenue similar to the one between Elm Street and Severin Court, one block away, ensuring the safety of children crossing the street while walking to and from Hillside Avenue School. The board will recommend that idea to the county, Mr. Marotta said, because Centennial Avenue is a county road. All of the residents opposed to the plan were concerned that it would turn the area into the exact opposite of what it was that made them want to move to town, a quiet place to raise a family and send their children to a safe school. Brandon De Oliveira, who moved to Cranford with his family as a child from Hillside, explained that Cranford is supposed to be a safe town for families with children, not a place filled with development of rental space. “Please remember why you or your family decided to move to Cranford,” Mr. De Oliveira told the board. Mr. Triarsi’s argument was that nothing can be worse than what has been in that spot since the 1980s. “There cannot be a less efficient use of land than what’s existed on this site for the past few decades,” Mr. Triarsi said. Board Secretary Jeffrey Pistol said there should be less residential space and more retail space. “It’s a very nice building, but it needs to be smaller,” Mr. Pistol said. According to Mr. Triarsi, it is not economically possible to reduce the number of units in the development. Mr. Triarsi said Centennial Avenue needs a shopping district similar to South Avenue and North Avenue, comparing the development to Cranford Crossing, a residential and retail building that replaced a vacant lot near the train station. “That was an area that was underused and now that area is the shinning star in this community,” Mr. Triarsi said. The applicant will next seek approval from the Union County Planning Board.